Les Grands Hurleurs performs a free, outdoor concert from 8 to 9:30 p.m., Thursday, Aug. 9 at the Levitt Pavilion in Westport. The Two-time Felix Award-winning trio from Quebec are touring with their latest award-winning album. Traditional music flirts with classical, Manouche, electronica, and folk! 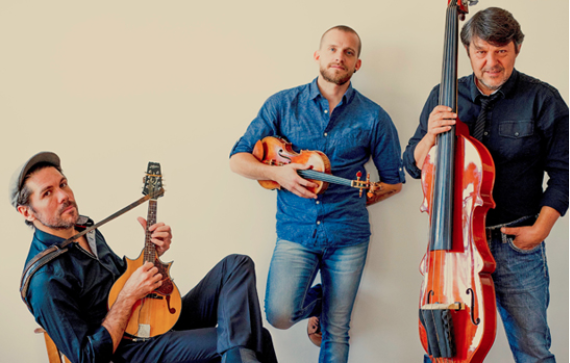 The Quebec-based Les Grands Hurleurs is on the road with its ¾ Fort show inspired by the repertoire of its newest award-winning CD of original, open-minded music, very much alive yet respectful of its roots. Since its inception in 2009, Les Grands Hurleurs have earned a solid reputation, accumulating a lot of experience in countless Quebec venues, international stages (Czech Republic, France, Germany, Spain, Switzerland, the USA) and on major events including recently 2017 Canada Day in Victoria, & 2017 Canada Summer Games Winnipeg. Picnics are welcome. The Levitt Pavilion and its perimeter is a non-smoking area. Pets are not allowed. For free shows, tickets are not required (unless otherwise noted in show description); free entry on first come basis. The Levitt Pavilion and its perimeter is a non-smoking area. In case of inclement weather, call our concert hotline (203-221-2153) or check back here and click on the event at or after 4.30 p.m. on the day of the show for a location status update. While we have a nearby rain location for free shows, we always do our best to stay outside shower or shine!The Levitt Pavilion for the Performing Arts produces one of the longest running free outdoor festivals in the nation. Established by the Westport community in 1973, the Levitt Pavilion remains an independent 501(c)(3) not-for-profit organization. The only way to support us is directly! Become a member or make a donation directly at www.levittpavilion.com.